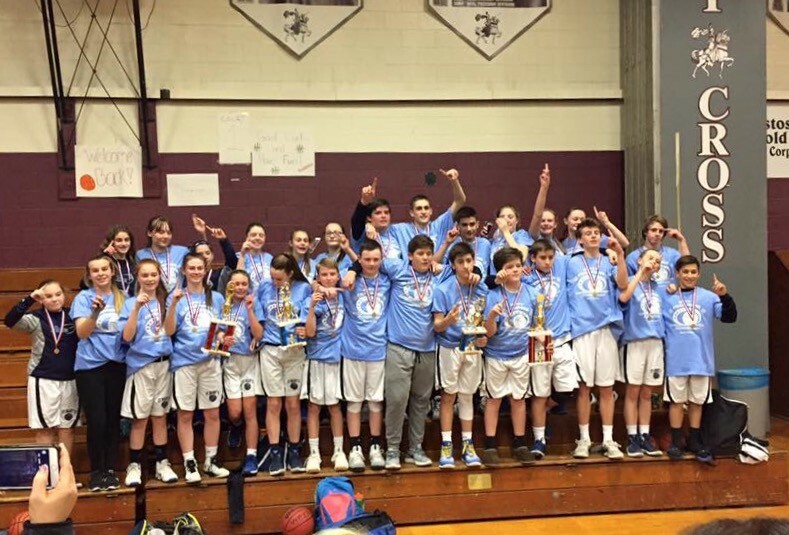 The girls and boys varsity teams from have successfully defended their Burlington County CYO titles. The girls and boys varsity basketball teams of the Saint Mary of the Lakes School. The Saint Mary of the Lakes School varsity girls and boys basketball teams have done something this season that has not been done before: both teams have successfully defended their Burlington County Catholic Youth Organization (CYO) titles, with exhilarating come-from-behind wins on Sunday, March 12 at Holy Cross High School. The varsity girls team defeated Sacred Heart Riverton in a nail biter, with a final score of 40–37. The girls withstood a dramatic Sacred Heart comeback and overcame their late 3-point lead to win the game. Christina Ackerman scored 6 key points down the stretch, and 2 foul shots by Ava Taylor iced the game with only seconds remaining. Then, the varsity boys team defeated rival Our Lady of Good Counsel, despite a close game until the end of the third quarter. Then the team took the lead in the fourth quarter, ending with a 62-43 victory. Nick Tamburro, Matt Fish and David Alleva each scored in double digits, with Alleva dominating on the boards.